San Luis Potosi, SLP in Mexico is a part of the Logistics Plus® network. This office provides LTL and truckload brokerage, air and ocean freight forwarding, warehousing and distribution, project cargo, import/export, and global trade compliance services. 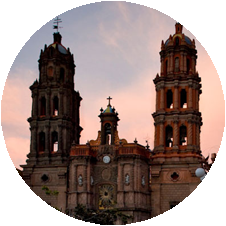 The city of San Luis Potosi was founded in 1592 near the gold and silver mines in Cerro de San Pedro and is the capital of the state of San Luis Potosi. It is considered to be a main industrial center, and is strategically located in the center of a triangle formed by Mexico City, Guadalajara, and Monterrey. San Luis Potosi is the home to Ponciano Arriage International Airport. For the past decade, the city has experienced growing foreign industrial investment. There is also a growing tourist industry due to promotion of the city’s historical architecture. San Luis Potosi is also home to a Logistics Plus office where we proudly serve both small and large businesses throughout the region. If you’re located in San Luis Potosi, or any other surrounding community, your friends at Logistics Plus are ready to provide you with local, domestic, and global transportation and logistics services. Additionally, we’ll show you how our people in Mexico put the “plus” in Logistics Plus by doing the big things properly, and the countless little things, that together ensure complete customer satisfaction and success!